Bloodletting comprised a mainstay of medical therapy until the mid 19th century. This practice was guided by the belief that health derived from a balance of the four humors in the body (including blood). Healers focused upon restoring the system’s equilibrium, usually by draining or purging the system of excess humors. Over time, bloodletting became closely associated with American medicine’s “can-do” attitude. Patients expected their physician to intervene, not sit by passively as disease took its course. In early America, bloodletting became the therapy of choice when Benjamin Rush (1746-1813) pronounced that all disease stemmed from a single cause: vascular tension. If disease consisted of vascular tension, then bleeding (and purging) could effect a cure by relieving that tension. Rush did not hesitate to remove as much as a quart of blood at a time, and to repeat this procedure two or three times within forty-eight or seventy-two hours. Given that the blood volume of an average sized man will be about six liters, or a little more than six quarts, it is apparent that Rush could let out a good half of the patient’s total blood in a very short period of time. Not all Rush’s contemporaries bled patients to this degree, but it was not uncommon for a physician to remove 12 ounces of blood at a time. In practice, bloodletting consisted of venesection, the opening of a blood vessel with a lancet, and scarification, cutting through capillaries just beneath the skin. 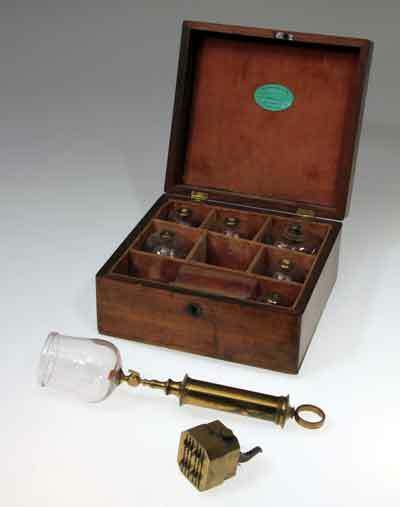 The contents or a bloodletting instrument case includes a brass scarificator, six glass cups, and a brass syringe. The scarificator concealed several small blades, which cut into blood vessels just below the skin surface. Cups would then be applied to the wound, and suction created with the accompanying syringe. This bloodletting case belonged to John Waterman Hamilton (1826-1898), a surgeon from Columbus, Ohio. It dates from about 1800 and was therefore already something of a relic when Hamilton graduated from medical school in 1847. He apparently inherited it from William Hamilton (1700-? ), a relative who was consultant to George Washington’s personal physician Dr. James Craik. Ironically, bloodletting played a significant role in Washington’s demise. During the President’s final illness Craik and his colleagues bled him repeatedly, removing three quarts of blood. They did so in the firm belief that it constituted the best remedy. In the 1830s the therapeutic value of bloodletting came into question. At that time Pierre Charles Alexandre Louis (1787-1872) used the “numerical method,” or statistical analysis, to discredit this therapy. Nevertheless, many ordinary practitioners clung to bloodletting for another thirty years, or longer. Audrey Davis and Toby Appel. Bloodletting instruments in the National Museum of History and Technology. Washington, Smithsonian Institution Press, 1979. J. Worth Estes, “George Washington and the doctors: treating America’s first superhero,” Medical Heritage 1(1985): 44-57. O. H. Perry Pepper, “Benjamin Rush’s theories on blood letting after one hundred and fifty years,” Transactions and Studies of the College of Physicians of Philadelphia 4th ser. 14 (1946):121-26.